Nearest: Tube Station: Russell Square 0.2 miles (0.4 km), Railway Station: London Euston 0.7 miles (1.1 km), DLR Station: Tower Gateway 2.4 miles (3.8 km), Motorway: M1 Junction 1 5.7 miles (9.2 km). Fantastic location for the tube system with no less than 6 The Grange Blooms Hotel, an 18th century town house, is located just off from Russell Square, a central location, just North east of centre. Walking distance from this location are Covent Garden (0.3 miles) and Soho (0.5 miles), two of London's most popular tourist areas. 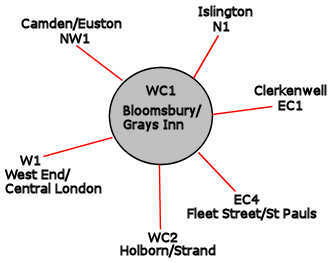 Also close by is Bloomsbury with plenty of shops and amenities. Transport links from here are good with Russell Square tube just 0.2 miles and plenty of Taxi's passing constantly on this major through route for road traffic. This is also a good location for access into the City of London being on the edge of Holborn and some one and a half miles from the Square Mile (financial centre of the city of London). Nearest attractions include the British Museum (0.07 miles), Sir John Soames Museum (0.4 miles), Pollocks Toy Museum (0.4 miles), Dickens House (0.5 miles), Petrie Egyptian Archaeology Museum (0.5 miles), London Transport Museum (0.5 miles), Trocadero Centre (0.7 miles), Leicester Square (0.7 miles) and Cleopatra's Needle (0.8 miles). The Grange Blooms hotel stands within what was once the grounds of Montagu House, a large mansion in Great Russell Street constructed around 1680. The 26 en-suite bedrooms are all individually designed and decorated in a classic and traditional style. Facilities Satellite Television With Radio, broadband internet access, Telephone, Hairdryer, Trouser Press, Tea And Coffee Making Facilities. Among the range of bedrooms are rooms with four-poster bed and canopies with views of the hotel garden. Four bedrooms have their own themes of 'Pickwick', 'Lords', 'Theatre Royal' and 'Dickens'. They cover arts, culture and sports themes. 24 Hour Room Service. Free newspaper. Wake-up call by request. The Blooms Restaurant: Views out over the hotel gardens. This is where a daily breakfast is served, Full English or Continental. The English Country home tradition of Afternoon Teas observed every day in the lounge where guests can also unwind with a pre-dinner drink. The Grange Blooms also features a small but refreshing gardens with terrace, offering a tranquil spot to enjoy breakfast on a sunny morning or a pre-theatre drink in the evening. A nice spot to hold a meeting with its fountain and trees. The hotel has two meeting/function rooms should you require these facilities. There is a concierge/porter service and the the reception is always staffed, 24/7 and has a safe for guest use. Hotel has a lift to each floor. Grange White Hall Hotel: is 54 yards (49 metres) away, has a guest satisfaction score of 74% and rates start from about £75. Grange Portland Hotel: is 144 yards (131 metres) from here, earns a customer rating of 82% and base rates begin at about £86. Grange Buckingham Hotel: 174 yards (159 metres), rated at 82% and with rates from around £99. Grange Holborn Hotel: 381 yards (348 metres), rated at 81% and with rates from around £124. Compared to other London hotels: This hotel has been rated 81% by past guests. The London average is 80% and the average for 4 star hotels is 83%. Therefore although the hotel is above average for London as a whole this hotel is below average for its sector (star rating) . Grange Hotels across the chain average 79% so this hotel is just above the average rating for Grange hotels. Milesfaster ranking: 450th from 866 London hotels, 6th of 13 Grange Hotels, and 208th of 328 four star rated hotels. Another to Consider: Also close by and a similar hotel (0.1 miles, 0.2 km) would be the 4 star Chamberlain Hotel, whose lowest rates start at about £87 and which has a 91% guest satisfaction rating. The Chamberlain Hotel also offers: free WiFi. The fifty hotels that are closest to this location (7 Montague Street, WC1 postcode) which we list extend for a 0.5 miles (0.8 km) radius. Consisting of 7 five star hotels (average rating 91%), 24 four star hotels (average rating 84%), 13 three star hotels (average rating 78%), 4 two star hotels (average rating 71%) and 2 one star hotels (average rating 62%). Of the 50 local hotels top rated are Montague On The Gardens Hotel (4 star) and also the Covent Garden Hotel (5 star) (both joint top with 99%). Base Rates: We show you the average starting rates (base rates) in the area and break it down by star rating. Trouble with this is that base rates do not include special offers and limited low rate deals. However they remain a useful guide to general rates. The average base rate when considering all hotels in the surrounding area is £126 per night. Starting from £16 at Generator Hotel (2 Star, 77%) with top rates of £363 at Rosewood London Hotel (5 Star, 98%). Rate averages listed by star level: Five Star average: £265, Four Star average: £129, Three Star average: £81, Two Star average: £39 and One Star average: £53. We rank hotels based on our own proprietary algorithm based mainly on guest ratings but adjusted for influencing factors. We rank Grange Blooms Town House Hotel 25th (joint) of the 50 local hotels and 15th (joint) for the 24 four star hotels in the area. The hotel is 12th of 50 (1st (joint) of 24 four star hotels.) for lowest standard rates locally. Looking at the hotels rates plus its user rating we rank it 18th of 47 for sheer bang for buck (SoHostel was top).